CrystalCPUID has released it latest version, CrystalCPUID 4.11.1.334 which can support Win9x / WinME / NT4 / WinXP / WinVista. 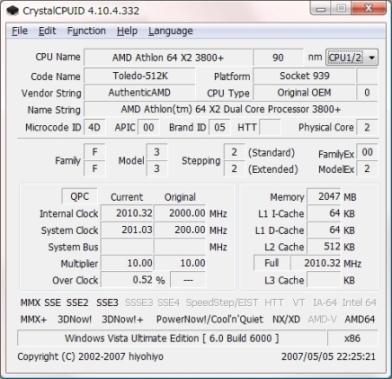 CrystalCPUID is a useful application that shows detailed information about the processor, the chipset, bios and cache. It is quite similar to WCPUID, but it covers a wider range of information about the processor. It contains a real time clock checker and features multiplier management. The latest version of CrystalCPUID 4.11.1.334 supports all Intel and AMD processors. In this version, it can support Mobile Sempron (Keene) processor, Mobile Athlon (Odessa) processor and supports AMD K10 family. Get your latest version of CrystalCPUID 4.11.1.334 (Freeware).